DJA Inspection Services safely performs above ground storage tank inspections in the petroleum and chemical industries worldwide. Inspections are performed through the use of precise instrumentation, equipment and experienced personnel. DJA Inspection Services has industry certifications for inspection of storage tanks. The strength of DJA Inspection Services' management team stems from combined expertise in both management and technical areas. This has produced outstanding results in safety and inspections since 1990.In addition, the leadership and alignment characteristics of DJA Inspection Services' management team have resulted in the establishment of broad and flexible goals designed to meet the ever-changing demands of the quickly moving marketplace. It is the mission of DJA Inspection Services, Inc. to safely provide full service tank inspections to the storage tank industry, to be known for quality and detailed inspections through the dedication and experience of our team and to provide the service worldwide as well as to the individual tank owner. With over 1,000 tanks inspected per year combined with an experienced staff, DJA has developed an inspection approach that clearly shows our ability to perform and utilize our knowledge of tank inspection. Please see our client list. DJA has over 100 years combined inspector experience. We have the ability to inspect tanks of any construction and size. Certifications include API-653, API-510, API-570, and Steel Tank Institute. DJA Inspection Services, Inc. management comes from the refining industry. 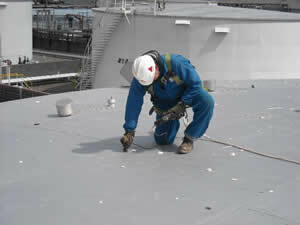 Therefore, DJA approaches inspections in a manner that allows flexibility by the tank owner, and with DJA's techniques, inspections are done on time. You can trust DJA Inspection Services, Inc. to perform complete inspections and provide reports that are thorough and concise. DJA's knowledge of inspections is diversified as can be seen by our list of services.